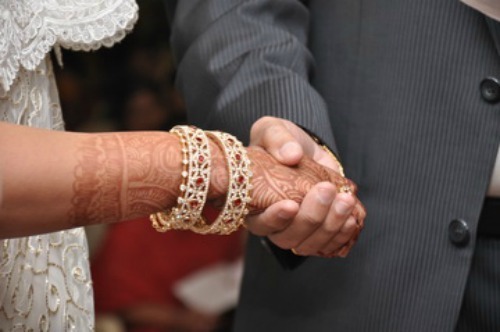 This day 2 years back we said 'I do' and life from then has been a memorable journey. We can't imagine its been 2 years already and sometimes we do feel its been a long time since we've been together. But no matter how we feel we still look back happy, hold hands tightly and look forward to all that is ahead of us. We want to take a moment to thank God for our life and our union, for all the blessings, family and friends that He has blessed us with. Thank You Lord for everything !!! 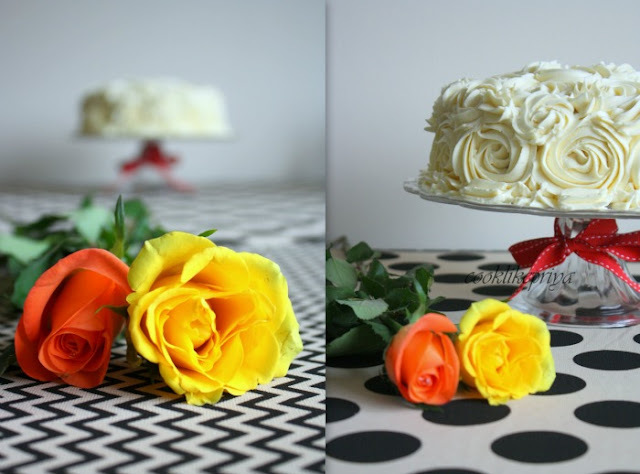 shall continually be in my mouth"
Every celebration sure calls for a cake and no doubt I was having a cake in mind and its sure roses for us. We both love roses and this time around to make matters simple I asked him what cake he wants and he chose the cake and the colors (there is a reason behind it, our wedding had a theme and it was red and white) and yea 2 years so 2 layers too. I was worried till the very end of making this cake, mind you I am a pure novice and can hardly hold an icing bag properly. I did practice quite a lot and this cake was sure a big leap for me. But at the end of it I did feel happy looking at this cake. I took 2 days to do this cake in all honesty simply to ease my work. First day was the sponge which to me was a big mystery since it was a red velvet cake, I wasn't sure how the color would be at the end. Although I still have doubts about the color, I feel it complimented the vanilla roses well. I look forward to improve my swirls, but for now this is a perfect cake for our celebration. In a large bowl whisk together eggs, buttermilk, oil, red food color, vanilla extract, vinegar until well combined for 3 minutes. Slowly add the dry ingredients to the wet in 3-4 additions and mix well, whisk together for 2 minutes. Pour the batter in the two pans, tap on counter top to release air bubbles and set in the middle of the oven to bake for 20-25 mins until a skewer inserted in center comes out clean. Once done let it cool in the pans on a wire rack for 10 minutes and flip it on the other side, now remove the parchment paper and let it cool down completely. In a large mixing bowl on high, beat butter for 2 minutes until pale and fluffy. Add the icing sugar little by little (3 times per cup) until well combined beating for 3 minutes between every addition. Add the vanilla, salt and beat for 3 minutes until combined Now add the milk as required to make the frosting spreadable/ easy to pipe roses. 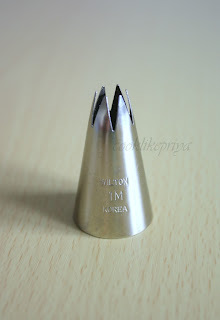 Fill the frosting in a piping bag with the Wilton 1 M tip intact and squish out to release air and keep aside. Place the first layer on sponge and add a big dollop of the frosting on top and using a spatula level the frosting , now place the second layer of came and repeat the frosting. Fill the sides also with frosting. Set in the refrigerator for 30 minutes to set. 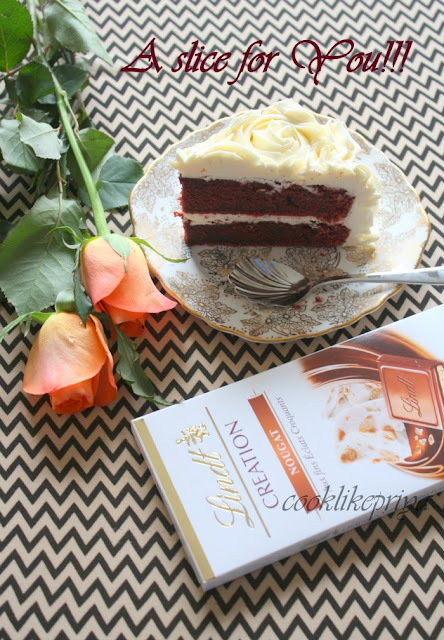 Take the cake out and start swirling roses. Press a star and cut it with a swirl, follow the same method and alternate swirls to form a pattern. When roses are large you will find gaps/ dead space, make a swoop with your tip. Dot the gaps with frosting or simply curl in the remaining gaps for a more neat effect. - I did the sponge layers one day ahead, covered with cling film and refrigerated to be iced later. This helps in letting the frosting set well. - Make sure you have enough frosting! 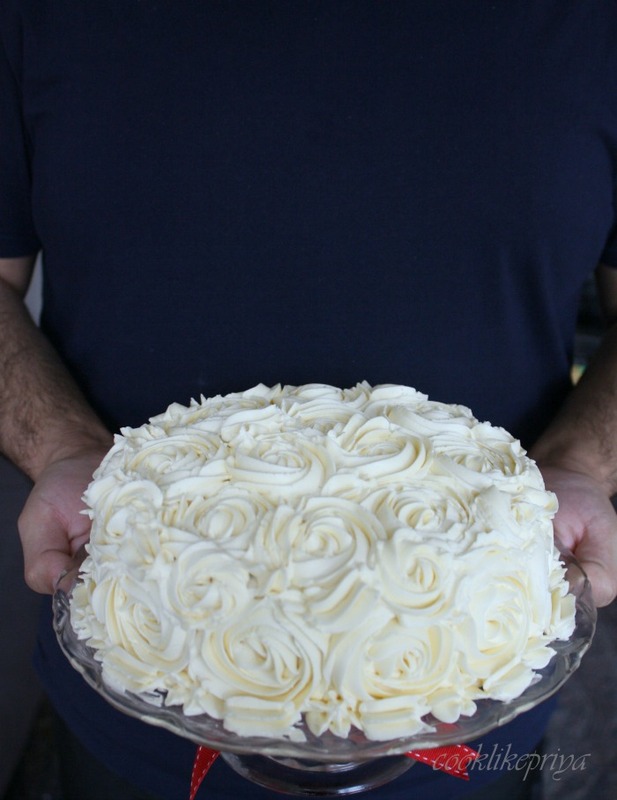 Those roses take up lots of frosting. 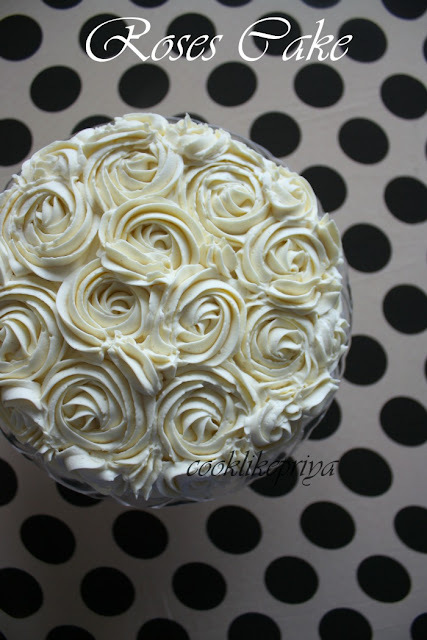 - Buttercream does tend to give pretty and sharper roses, hence I used it. 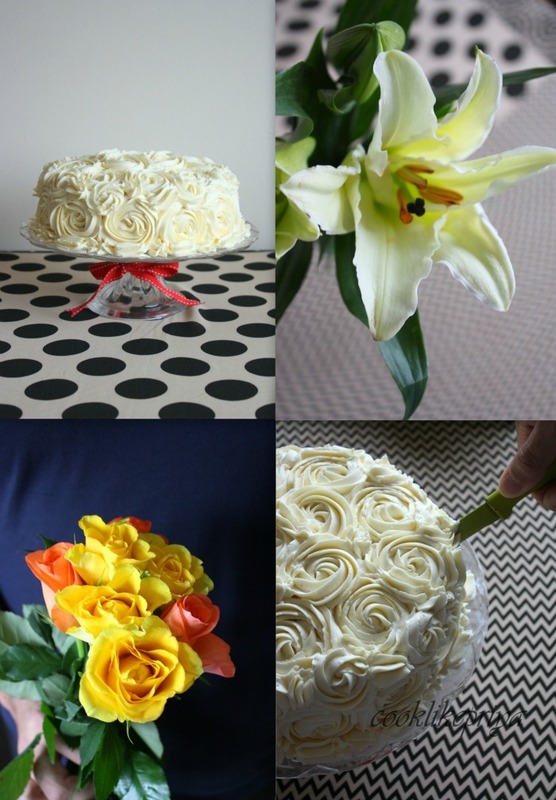 - To make cake flour at home for every 1 cup of all purpose flour, remove 1 tbsp of it and replace with cornflour. Rosette cake recipe is an inspiration from I am Baker. Happy Anniversary. Awesome cake with lovely flowers. Once Again my hearty Wishes dear! 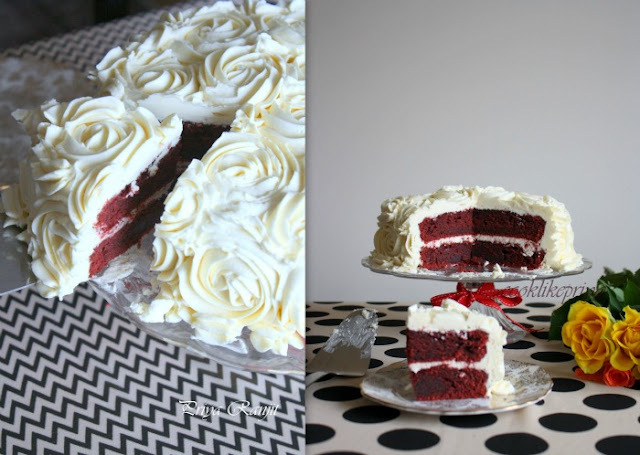 Lovely Write up...Cake looks Gorgeous...loving it to the core...beautiful pics too! Omg, am speechless and cant take my eyes from the last click, unfortunately the BB was last week,if its this weekend i would have atleast enjoy that slice, beautifully done and none will say that you are a novice in piping..Happy anniversary again Sis. Lovely cake n many more happy returns of the day guys..Amazing effort Priya and well paid off in the end. Happy anniversary Priya :) WOW!! 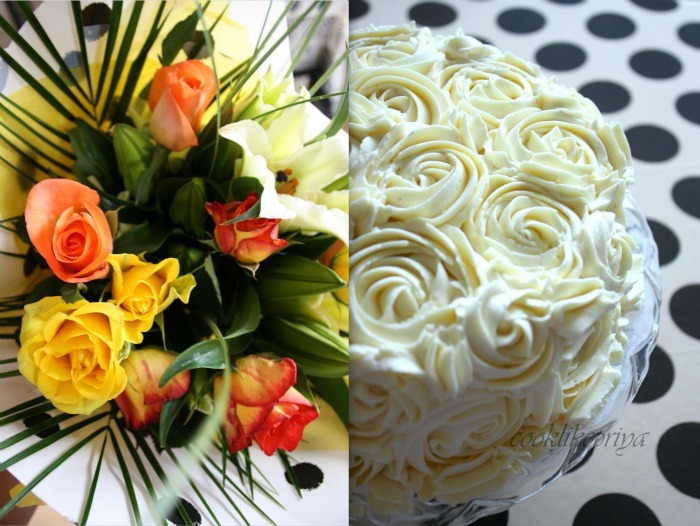 your cake looks very elegant and professional.It looks like a bouquet. Happy Anniversary and Many More Happy Returns to You Priya! Beautiful cake..perfect for the occasion! happy anniversary !! delectable treat to my eyes :) your hubby is is lucky to get edible bunch of roses for the occasion !! Congratulations Priya. The cake is awesome. You have done such a fab job in frosting. Happy Anniversary Priya...Irresistible cake!! !Mouth watering clicks!!! Lovely cake for right time. Happy Anniversary. Wow .... No words Dear to say .. Happy Anniverasary n many more :-) Cake looks awesome !!! Drooling here . Congratulations on your wedding Anniversary. God bless you both. Have a gr8 time. The cake looks abs. sinful. You had made it tooooooooooooooo good. Happy anniversary akka :) Hugssssss.. Deepest wishes...Glad to follow u...The cake looks super moist and yummy. Congrats.I wanted to try my hands on icing,tnx for the step by step pics,will be very helpful.btw love the cake and the roses.looks cute and perfect. happy anniversary.cake looks very beautiful priya. happy anniversary dear.. all the clicks are so beautiful and looks romantic :) enjoy the day..
Raining roses now?? for rose cake?? Very nice da. Love the cake.. Beautiful! Also thanks for the step by step pictures.. Very useful.. Happy Anniversary, Wow! Looks lovely.Wonderful Work ! Rose looks beautiful Priya, You did wonderful job. . yumm. Happy anniversary to both of you. Happy Anniversery..what a wonderful cake with roses,surely u worked hard for roses. Happy two years of togetherness and a beautiful looking cake there. God bless you both. btw i cant take my eyes off from the cake. Two years together - and that means such a long way to go happily with each other. Belated happy anniversary Priya dear. OMG! this cake looks just like droolworthy. Amazing clicks dear. Can feel your love for him from your last click dear. God bless you always my dear sister. Your cake is stunning! Happy anniversary and a wish for many more! Belated Anniversary Wishes Priya. Your cake looks marvelous.... Very nice presentation. I loved your write up. Convey my wishes to your hubby too. Wow! I just can't take my eyes from it. Happy anniversary Priya!!!! The cake looks gorgeous and the roses are beautiful. iam so much excited looking at all your recent bakes priya. 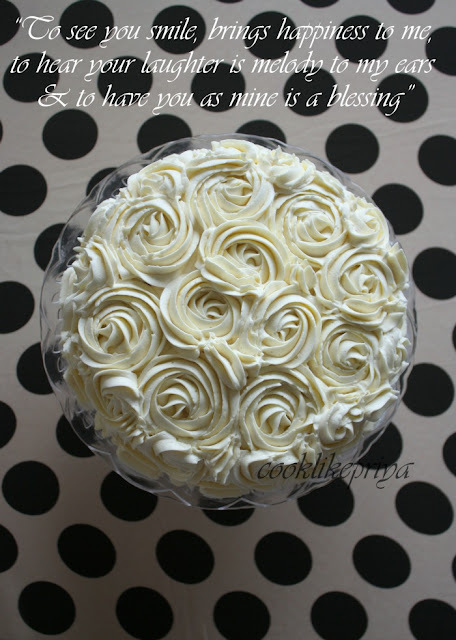 this cake looks Gorgeous and belated anniversary wishes dear. Wow!!! This is such a gorgeous cake!!! I've seen it on many blogs, but your instructions are the best :-). Now, I'm considering making this for my parents' anniversary next month! This is a beautiful cake and explained so well! I am totally in love with your blog! Lovely! God bless you both super abundantly and I agree, the best and important prayer is Thank You Lord!